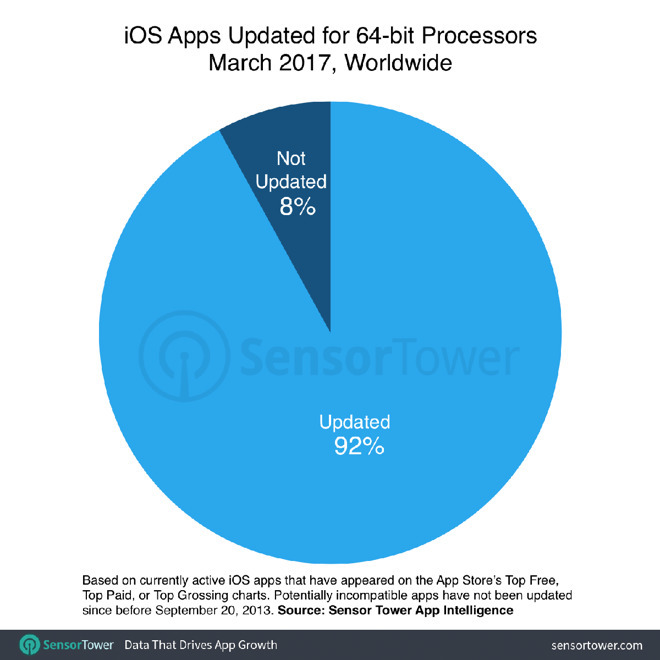 The number represents about 8 percent of all titles on the App Store, Sensor Tower said. The real-world figure could potentially be much higher though, as the firm's numbers are based on apps that were submitted prior to the Sept. 2013 launch of the iPhone 5s and haven't been updated since. The iPhone 5s was the first iOS device to include a 64-bit processor, but it was only in Feb. 2015 that Apple required new apps to offer 64-bit support. For updates to existing apps, the cutoff was a few months later in June. With the first iOS 10.3 beta, Apple inserted a message warning that 32-bit apps "will not work with future versions of iOS." Previously iOS only cautioned that 32-bit apps might slow down a device. "iOS 11" would be a logical cutoff point. The finished 10.3 update has yet to be released, and Apple is expected to reveal iOS 11 during its Worldwide Developers Conference in June. Many apps could be potentially be removed from the App Store by the time "iOS 11" launches later in the year. Recently the company engaged in a purge of broken or outdated apps, and indeed Sensor Tower noted that 47,300 apps vanished in October alone. iOS 10.3 will bring in a number of changes, including the switch to a new filesystem, APFS, and the addition of a Find My AirPods app. It will also incorporate an official Reviews API, which may reduce the tendency of apps to ask for ratings.